Ascending Butterfly: Got Frizz? Fight the April Showers with Liqwd! Does that sound a bit counter-intuitive? You can actually keep the frizzies at bay with Liqwd! 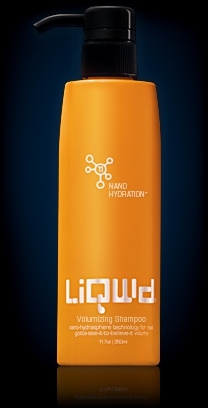 No, not liquid, Liqwd! Let me start by saying this review is super long over-due, but the only benefit to that is that I really got to road test the product under every weather condition imaginable! An unprecedented capsule collection, LiQWD professional products feature exclusive Nano-Hydrasphere™ and ColorLife® Technologies. Nano-Hydraspheres™ turn vital nutrients and potent volumizers into microscopic particles capable of penetrating the hair shaft to treat and transform critical, previously unreachable, cortex layers. ColorLife® works synergistically with Nanos to lock color brilliance and essential moisture in and environmental hazards out. I have very fine hair that is wavy and super frizz prone, which is a difficult combo to work with. Not only do the pros have trouble keeping my mane shiny and fab, I have even more trouble! I find myself in a 'hair catch 22'. Taming the frizz, sometimes causes people to use products that 'weigh' the hair down to keep frizz at bay. But with fine hair, that will end up knocking all the body out of your hair, and if the frizz products are oil based and applied from root to tip, most of us with fine hair end up with the front almost greasy looking, but the middle to the ends still dry. Not pretty! While April will always be my favorite month of the year because it's my Birthday and the start of Spring, it's also the month where 'April Showers bring May Flowers' and while I love Flowers, I do not love April Showers! and I hate what April Showers and humidity does to my hair! My normal response to bad hair days are to book an appointment, but right now, salon visits are not in the budget! But I do have an arsenal of hair care products that help me keep the frizz at bay between Salon Visits! Healthy hair is hydrated hair, so start with the Hydrating Shampoo! 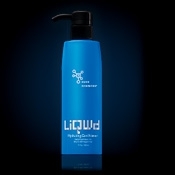 The ultimate, moisture-powered solution for hair that’s processed, damaged or just plain parched. The result is fresh, dynamic, treatment-ready hair. I loved the smell and the way my hair felt from the first use. I don't know about you, but I can usually tell even when my hair is still wet, how well my hair will respond to the product. These are definitely salon quality and a little product goes a long way! 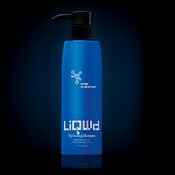 Liqwd calls this "The ultimate, everyday treatment for hair that's processed, damaged or just plain parched. The result is vital, voluptuous hair that radiates health, feels phenomenal and performs to perfection." I personally see this as far from 'everyday'. It certainly rivals many 'deep conditioning' treatments I've paid for in pricey salons! If you noticed that the Volumizing Shampoo has a slightly bigger picture, it's because it is my favorite. It provides the same 'nano-hydration' for healthy, shiny hair, but also builds the volume that my fine, frizzy, thin hair lacks! In the words of Charlie Sheen 'Duh, Winning'! It's encouraged on their website to mix and match products across their lines to get customized results, and this definitely worked wonders for me. My best results were achieved by using the Hydrating Shampoo, the Volumizing Conditioner, and the Think Big Professional Volumizing Catalyst (if like me you have very fine, thin hair, then I would suggest using LESS than the instructions require!). And the creative, graphic designer side of me can't help but point out how sleek and wonderfully packaged the products are! After visiting their blog, I'd definitely love to try the LiQWD Q-Keratin Smoothing Treatment next! It is Formaldehyde and Paraben free! 1) Ends 04/15 - Yanni Truth of Touch CD Review and Giveaway! - Enter HERE! 2) Ends 04/19 - Easter Basket of Your Choice Giveaway! - Enter HERE! FTC Disclosure: I was not asked to write about Mom Central's Grant Program, nor does writing about it improve my chances. I feel the message they are sending by supporting bloggers efforts to grow their brand is an important and powerful one! This is not a paid insertion. This is a non-compensated post and all opinions regarding the product are expressly my own experiences. I was provided product to review, this in no way influenced my opinion of my experiences with this product. I just got out of the shower and my hair is FRIZZY! !